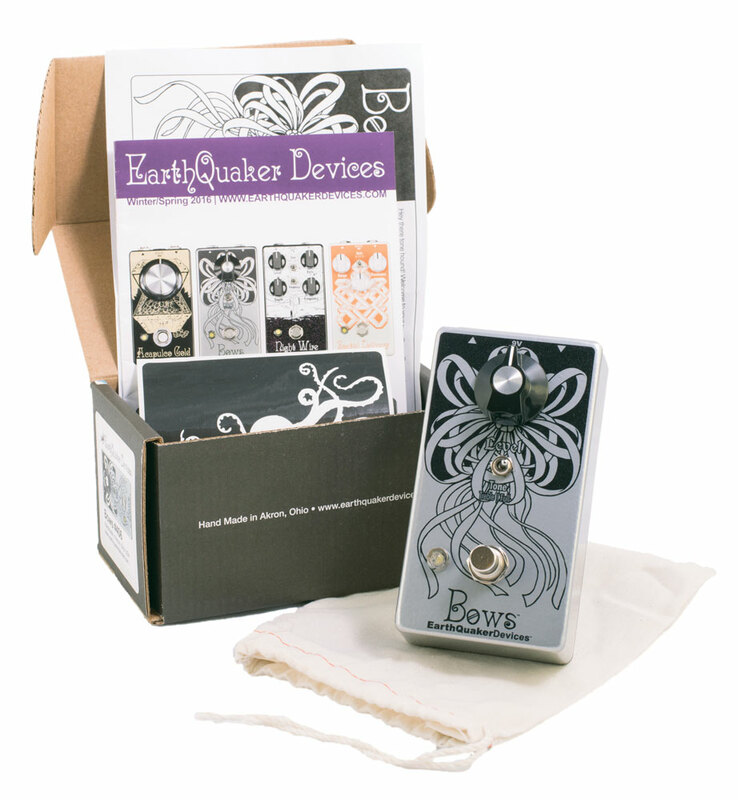 The Bows is a Germanium preamp designed around a rare NOS OC139 black glass transistor. For being a little one-knobber the Bows wears many hats. Right out of the box it's got several tone shaping abilities spread between two modes: Full and Treble. Full mode is warm with a lot of body and low end. Treble mode is a resonant, treble booster with a “cocked wah” tone that can drive any tube amp into harmonic rich distortion territory. Each mode has a little bit of grit to start with, but as you get passed 12 o'clock on either setting their subtleties are accented. The vowel-like sound out of the Treble side will be more prevalent as you bring the Level up. Doing the same on Full mode will get you a nice, full bodied crunch tone that retains clarity. Place any drive pedal before the Bows and it's another story. Full mode turns a dirt signal into a crumbling wall of sonic chaos, while Treble mode becomes an ultimate lead tone. Each and every Bows is built one at a time by real life human beans in the temperature controlled bubble of Akron, Ohio. Level: Adjusts the output level by setting the bias voltage of the transistor. A small amount of noise while dialing this in is perfectly normal. Tone Toggle: “Treble” for a brighter, more resonant tone and “Full” for a warmer, bass-heavy push. Please use a standard 9 volt DC power supply intended for musical instruments with a negative center 2.1mm barrel or a 9v Battery. Current draw is 9 mA.